Finding the courage to ask for help is tremendously hard. Having no one answer that call is heartbreaking. 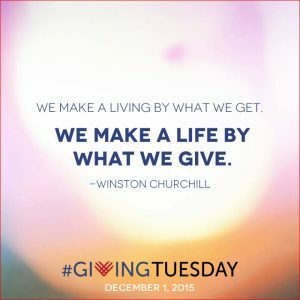 This Giving Tuesday, please find a way to make someone’s holidays a little brighter. A few weeks ago I attended the Academy of Nutrition and Dietetics Food & Nutrition Conference & Expo™ (commonly referred to as FNCE®, pronounced FINN-see). This is the annual event in which 8,000 or so registered dietitians and others working in the nutrition field congregate and learn the latest nutrition science and research, sample new products, get a peek at the latest trends, and network like crazy. For me, FNCE is like an annual reunion, where I get to see – or meet for the first time – people I communicate with throughout the year on social media and via email. It’s fun, but hoo boy – is it exhausting!! Which is probably why it took me this long to write up my FNCE recap. I needed the rest and recovery! We love our snacks! According to the USDA, about 96% of Americans reportedly snack at least once per day. That trend was certainly apparent at FNCE, with snack foods galore. And not only were these snack foods packed with nutrition and taste, the brands also wanted you to know what they didn’t have, like GMOs or nuts or gluten or high-fructose corn syrup. We’re also nuts for protein! Protein may be the one nutrient of which most Americans consume the right amount, but boy do we love protein! And there are myraid ways to get protein – not just the traditional sources like meat and dairy, but also protein-fortified bars and beverages. We like to mix things up! Setting aside the “yogurt gets a passport” trend (see previous blog post on that topic), we love customizing our own foods, mixing savory with sweet, crunchy with creamy. You could see that in action with yogurts (SO many yogurt options), cottage cheese – even strawberries. Curious to hear from other RDs and the trends they picked up on at FNCE. Leave a note in the comments! Disclosure: Welch’s is a client, but I was not compensated nor asked to write this post. All thoughts and opinions are my own. It’s blazing hot out there! As an ice cream aficionado myself, one of my favorite ways to cool off is to indulge in a sweet creamy treat. 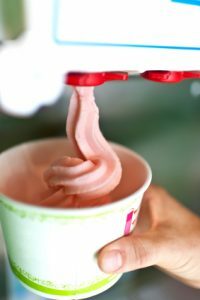 And with National Ice Cream Month just around the corner (July), my latest Dietitian Dine-Around will be on self-serve frozen yogurt bars. Sure, you’re free to choose as much or as little frozen yogurt as you want, but with a myriad of delicious-sounding (and healthy-sounding) flavors such as nonfat Cookies N Cream or Greek Yogurt with a Touch of Honey or Soy Bean, it’s really hard to pick just one or two. Moving on to the topping bar – now THAT’s where things can get interesting. You can top your treat with everything from fresh cut-up fruit to Froot Loops; go traditional with Snickers crumbles or nostalgic with Nerds – the possibilities are nearly endless. Since you pay by the ounce, you might think it’s OK to allow yourself to go crazy on the flaked coconut but find yourself rationing yourself to one or two blueberries and other “heavier” toppings. Choose the smallest bowl. Always. Even if you’re sharing. Believe me, it’s big enough. n’ cream frozen yogurt flavor topped with crumbled Oreos sounds like overkill to me. Practice restraint at the topping bar. Again, just a handful of toppings should be enough. Remember, soon this will all be a melted, gooey mess. Will you really be able to distinguish the Twix crumbles from the Kit Kat crumbles? Disclaimer: The opinions on this post are my own. I was not compensated for writing this post, nor was I approached in advance by any of the companies or people mentioned within. Do you have the January blues? You know what I mean – the holidays have come and gone, with the next major holiday not until Memorial Day in May (unless you’re one of the lucky ones who gets Presidents’ Day off); the weather is dreary and cold; your New Year’s resolution of eating healthier is starting to get boring…time for some inspiration and comfort to get you through the winter blues. One thing January has going for it is that it’s National Oatmeal Month. 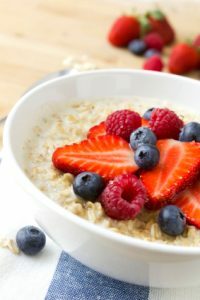 Now, oatmeal isn’t much to look at – it IS pretty blah on its own – but it’s a nutritional powerhouse that’s just begging to be dressed up with other nutritious ingredients. 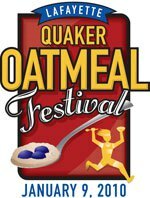 Near where I used to live in Colorado, there is an annual Oatmeal Festival. The event kicks off with a 5K race and ends with a health fair, cooking contest and perhaps the world’s largest oatmeal topping bar. At this breakfast you can top your oatmeal with the usual fruit and nuts, but among the offerings as well are M&Ms, peanut butter, gummy bears and jelly beans. Perhaps not the healthiest way to prepare this breakfast dish but, hey – those folks just ran 3 miles! And besides, anything that gets people to try a healthy dish they might not otherwise is considered a win in my book. It’s a whole grain – According to the Dietary Guidelines for Americans (2010), at least half of the grain products we eat should be whole grains. The reason is that whole grains have more fiber than refined grains since the bran and germ remain intact. Refined grains keep just the starchy part – the endosperm, and the bran layer and germ are removed. It’s a good source of fiber – Nearly all Americans aren’t eating enough fiber every day. For most adults, that’s 25-38 grams daily. One half-cup of oatmeal provides 4 grams of fiber. Add some berries or nuts, and you can easily get one-quarter to one-third of your daily fiber goals just at breakfast! It helps lower cholesterol – the fiber in oatmeal, beta-glucan, is a heart-healthy soluble fiber that essentially attracts cholesterol like a magnet and helps flush it out of the body. It’s inexpensive – One 18-oz. can of Quaker Old-Fashioned oatmeal, which makes 13 half-cup servings, sells for $2.95 at my nearby grocery store. That’s 23 cents per serving! For comparison, an 18-oz. box of Cheerios, which contains 18 servings is $4.85, or 27 cents per serving. It may be a galactogogue – OK, so I don’t have the science to back this claim up, but there’s an old wives’ tale that eating oatmeal may help increase milk supply for breastfeeding women. For something as healthy as oatmeal, it certainly can’t h urt for a nursing mother to try. Back in my pre-kids days when I ran marathons, a packet of oatmeal (plus coffee and an orange) was my standard breakfast before long runs and races. The packets and oatmeal-to-go dishes were perfect for out-of-state races – I’d just heat some water in the hotel room coffeepot, mix and go. That, and when I travel is perhaps the only time I can tolerate the pre-packaged oatmeal. I find it’s a little too sweet for me, and I prefer the texture of old-fashioned oats (instant oats are chopped smaller to make them cook faster). Mix the dry oats with the milk and water in a microwave-safe bowl. Heat for 2-3 minutes on high in the microwave. Careful that the oatmeal doesn’t bubble over. Remove the bowl and stir in the frozen berries, almonds, brown sugar and cinnamon. Heat for 1 minute more on high. Let sit for 1 minute to cool and thicken. Enjoy! *If you’re using fresh berries, add after the oatmeal is done cooking. Nutrition per serving: 355 calories, 11g fat, 1g saturated fat, 121g sodium, 51g carbohydrate, 8g fiber, 14g protein, 27% daily value for calcium, 16% daily value for iron.